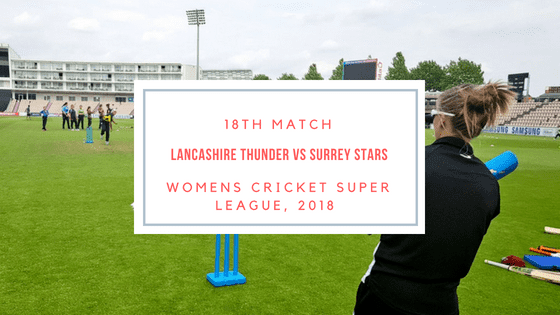 Lancashire Thunder is all set to take on Surrey Stars on Tuesday, August 07, 2018. LT is in the third position in the points table and SS is in the fourth position. In Today’s Dream11 Cricket Match Prediction SS vs LT 18th T20, Kia Super League, 2018, we will cover Toss Prediction, Probable Playing 11, Fantasy Cricket Tips/News, Pitch Report of Old Trafford, Manchester and Who Will Win? Who Will Win the 18th T20 Match, Between SS vs LT and Toss Prediction? Where Can You Watch the Live Streaming of LT vs SS, 18th T20 or Channels to Watch? If we compare both the teams, Surrey Stars has quality batswomen and Lancashire Thunder has quality bowlers. LT holds the third position and SS holds the fourth position. According to our astrology prediction, SS will win the match. The team winning the toss should opt to bowl first as chasing will be comparatively easy. According to our astrology prediction, SS will win the toss and ask LT to bat first. Date: The match will be played on the 7th of August 2018 (Tuesday). Match: Women’s Cricket Super League, 2018, LT vs SST, 18th Match. This season one game was played on this ground and it supported the batswomen and it is predicted that it will remain the same. The pitch will assist the batswomen. The bowlers will not get that much help from the pitch but they can take wickets if they bowl in the right area. Overall the pitch will be a batting-friendly pitch. If we look at the last three matches, LT has won one match out of three matches and SS has won two games out of three games. In the last encounter, Lancashire Thunder defeated Surrey Stars by 5 wickets with 1 ball remaining. The average first inning score of this ground is 142. The average second inning score of this ground is 109. Highest total on this ground is 191/7 in 20 overs by ENG vs NZ. Lowest total on this ground is 135/10 in 16.2 overs by NZ vs ENG. Amy Satterthwaite, Nicole Bolton, Evelyn Jones and Emma Lamb are the key performers of Lancashire Thunder Team. LT have won three matches out of five. Although they lost their last match, they will continue with the same playing 11 until and unless there is any fitness issue. Danielle Hazell (c), Eleanor Threlkeld (wk), Georgie Boyce, Harmanpreet Kaur, Alex Hartley, Amy Satterthwaite, Sophie Ecclestone, Nicole Bolton, Emma Lamb, Kate Cross, Evelyn Jones. Amy Satterthwaite, Harmanpreet Kaur, Natasha Miles, Danielle Hazell (c), Alice Dyson, Nicole Bolton, Evelyn Jones, Kate Cross, Eleanor Threlkeld, Alex Hartley, Natalie Brown, Sophie Ecclestone, Rachel Dickinson, Emma Lamb (wk), Georgie Boyce. Natalie Sciver, Dane van Niekerk and Sophia Dunkley Brown are the key performers of Surrey Stars Team. SS has won only one match out of four matches. SS may make a couple of changes to find the best winning combination. Hannah Jones may get a game. Sarah Taylor (wk), Grace Gibbs, Lizelle Lee, Laura Marsh, Mady Villiers, Marizanne Kapp, Bryony Smith, Dane van Niekerk, Sophia Dunkley Brown, Hannah Jones/ Eva Gray, Natalie Sciver (c). Marizanne Kapp, Rhianna Southby, Laura Marsh, Aylish Cranstone, Sarah Taylor (wk), Gayatri Gole, Dane van Niekerk, Bryony Smith, Natalie Sciver (c), Hannah Jones, Lizelle Lee, Grace Gibbs, Mady Villiers, Sophia Dunkley Brown, Eva Gray. Fantasy Cricket Expert Tips: Both the players are good. You can select anyone. 30.63% of the users have selected Sarah Taylor in their Dream11 Teams and 68.58% of the users have selected Eleanor Threlkeld in their Dream Teams. Make a combination of the above players for multiple teams. Conclusion: This is it for Today’s Dream11 Fantasy Cricket Match Prediction of SS vs LT, 18th T20 Match, which will be played on Tuesday 7th August. We have covered all the details required to win any fantasy leagues.